The World Schools Debating Championship 2018 was held at Zagreb, Croatia from July 17th to 27th. For the first time in ISDS history, Team India reached the Semi-Finals and Finals of WSDC, winning the Silver against Team China. Team India Breaks Records at WSDC ’17: Quarterfinals and Top 10 Speaker! At WSDC 2017 conducted from August 1-11 in Bali, Indonesia, Team India made it to quarterfinals and had a speaker rank in the top 10 speakers of the tournament for the first time ever! The team comprised of Chaitanya Kediyal (The Doon School, Dehradun), Dhananjay Ashok (The International School, Bangalore), Hemanth Chakravarthy (PSBB KK Nagar, Chennai), Karthik Tadepalli (from National Public School, Bangalore) and Tejas Subramaniam (PSBB KK Nagar, Chennai) broke records. This team went on to win all their in rounds on April 29th, breaking first to the final with a perfect score. They then went on to win the final with gusto – Tejas was adjudged best speaker at the tournament, and Harsith tied at second! Team ISDS (Indian Schools Debating Society) representing India and comprising of 4 exceptionally talented debating champions, shone brightby winning the 3rd Asia World Schools Debating Championship (AWSDC), held between 6th and 10th July, at Bangkok. At a time when people bicker about India’s performance in the international arena, here’s a team that made the country (especially Chennai) proud in front of a global audience. 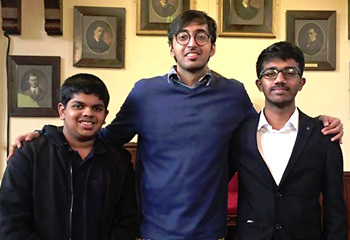 The WSDC international competition, held every year in a different location, has been the world’s leading school-level debating tournament for the past 25 years. The Indian Schools Debating Society (ISDS) is a not-for-profit organization, powered by the Ramco Group of Companies, that aims to take competitive debating to students across India. A pioneer in bringing the ‘World Schools Debating Championship’ format of debating to India, ISDS continually trains young Indians with the assistance of the best debaters from around the world.